Washington, D.C. – The Syracuse Orange have put an end to the Georgetown Hoya’s undefeated run with an 86-79- comeback victory. “I thought that it was a great comeback effort,” Syracuse Coach Jim Boeheim said. The Orange trailed the Hoyas for the majority of game until Syracuse began to full court press. Guard Tyus Battle hit multiple threes during the time that the Orange needed them the most. “Today the 3-point line worked for us,” Boeheim said. With less than four minutes to play Battle hit a three pointer to put the Orange within five points of the Hoyas. Then with just 1:30 left, Battle hit another three, bringing the score to 69-67. “It just gives me that mega confidence and confidence is everything with basketball,” Battle said about his clutch shooting. Guard Frank Howard’s lay up tied the game 69-69 with 50 seconds remaining. Three missed shots in the final moments of the second half could have won the game for the Orange, but the game was sent to overtime instead. 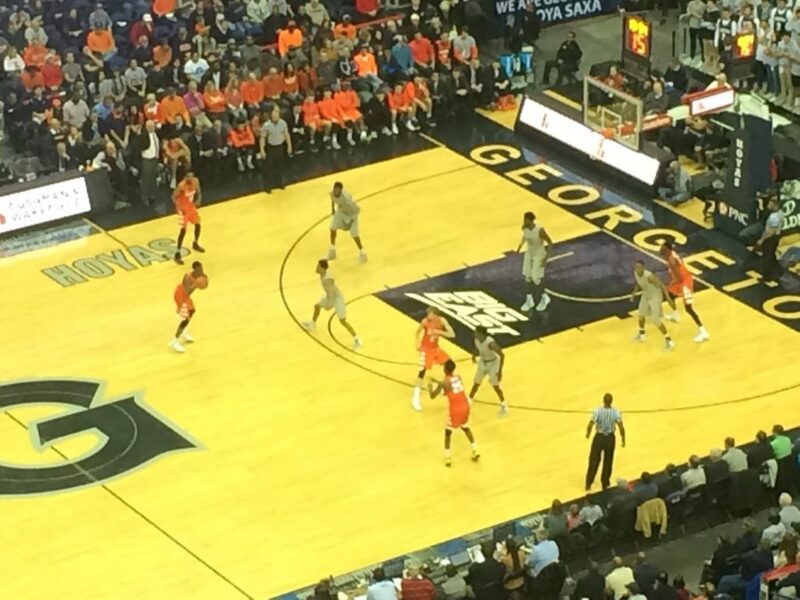 Syracuse dominated overtime shooting 77 percent from the field, while Georgetown shot 33 percent. Boeheim coached against Hoya’s head Coach Patrick Ewing when he was a Georgetown player. Ewing was a member of the team from 1981-1985, during the Pearl Washington era. “He brought tremendous basketball ability and determination to the game. I always appreciated that he played like a warrior. That’s how you should play basketball,” Boeheim said. Last season Syracuse lost to the Hoyas 78-71. The heated rivalry was one of the biggest in college basketball, but has died down a bit since Syracuse left the Big East. Battle was Syracuse’s leading scorer with 29 points for the game. Oshae Brissett recorded a double- double, scoring 25 points and grabbing 14 boards on the afternoon. “I just put it on my shoulders to get the team going and I was able to that,” Brissett said about his performance in the second half. Hoya Jessie Govan was a Georgetown’s leading scorer with 21 points. This matchup was Syracuse’s first true road game of the season. Both prior away games were played in neutral arenas. Last season Syracuse struggled on the road going 2-8. Boeheim expressed that playing on the road is tough but he has little worries about this season. “It’s hard to play on the road. It’s very difficult because of a couple of different factors but its mostly how good the other team plays again, everyone plays a little better at home, but we have always been a good road team till last year, ” Boeheim said.